Zeolite 4A Market size generated over USD 1.2 billion revenue in 2015 and expects gains at over 5%. Rising global zeolite 4A market demand as a detergent builder should drive growth over the forecast period. This can be attributed to increased consumer awareness about the polluting effect of phosphate based detergent builders on the environment across the globe. Regulatory compliances relating to environment protection as well as voluntary contracts has affected phosphates, surfactants and other detergent ingredients market. These factors have influenced zeolite 4A market size penetration as a detergent builder. Zeolites contain certain amounts of silica and aluminum, which has resulted in its extensive use in a host of applications including water treatment, air separation & drying, packaging, gas separation and petroleum refining. Presence of hazardous organic materials in wastewater is one of the most critical environmental issues that need to be addressed. Since, water used for drinking purpose is mostly obtained from these natural water forms, phosphate pollution turns as a serious threat to the quality of water. Excessive amount of phosphorous in water causes widespread growth of aquatic plants, which is ecologically unsustainable and eventually result in water contamination and pollution. Increased awareness about this factor has shown a great impact on zeolite based detergent demand. Thus, there is an increasing adsorbents demand with diverse particle size, large surface area and pore size distribution. Zeolite 4A market also finds extensive uses for adsorption as these products can separate components of mixture based on molecular size. Global liquid detergents demand was over 5.4 million tons in 2015 and may surpass 7.6 million tons by 2024, with gains at over 3.2% CAGR. Global powdered detergents market was over 12.6 million tons in 2015 and may surpass 15.2 million tons by 2024, with gains at over 2.3% during the forecast period. Hence, growth of end user industry is expected to have a strong impact on global zeolite 4A market size. Petroleum catalysts, owing to their ability to control the catalytic reaction is also an improtant avenue for zeolite 4A market growth. It offers better product recovery and low cost recycling as compared to other catalysts. Increasing demand for petroleum and petrochemical products along with oil & gas sector expansion is expected to leave strong footprint on global product demand. Global refinery output was 76,287.0 thousand barrels per day in 2013 and reached 76,865.1 thousand barrels per day in 2015. Product demand in petroleum refining industry is expected to grow due to increasing volume of refinery output in Africa, Middle East, and Asia Pacific regions. Intensive R&D activities are also undertaken in product based catalyst application to keep pace with the rapidly expanding refinery industry. Global zeolite 4A market for adsorbents was valued at over USD 312 million in 2015 and may generate over USD 535 million by 2024. Major manufacturing companies are investing in technological innovations to create new adsorbent materials, to meet changing industrial requirement. Presence of substitutes such as metals and other compounds may hinder industry growth. Rising high penetration of chemical and ecofriendly catalyst materials will affect zeolite 4A market price trend. However, silver infused sieves may create new prospects and boost product demand. 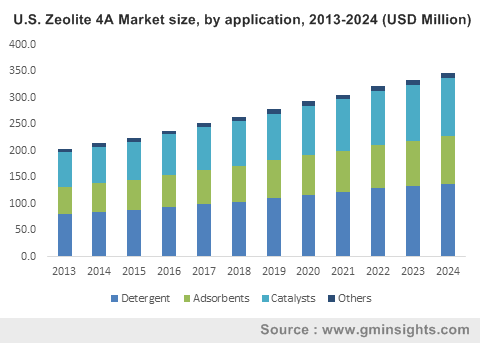 Zeolite 4A market size witness highest consumption from detergent applications and generated over USD 535 million business in 2015. It is majorly used as a replacement to phosphorus for manufacturing detergents, as they possess a high efficiency in dirt removal and preventing foreign particle deposition. Zeolite 4A market size from adsorbents should witness highest gains at above 3%. Water treatment, gas separation, packaging, oil refining and drying are key applications of adsorbents. In addition, favorable government initiatives encouraging product usage for water treatment in various regions along with increasing application in oil & gas industry is expected to drive industry growth over the forecast period. Zeolite 4A market size from catalysts may witness gains during the forecast timeframe. Increasing catalysts usage in the petroleum industry should drive industry growth. It is mostly used in the fluid cracking process and it has become a key ingredient in the reaction. China zeolite 4A market size should witness gains at above 3%. Growing infrastructure spending in China as are utilized for manufacturing light weight construction materials and asphalt concrete mixes should drive industry growth. Germany zeolite 4A market share should generate over 77 kilo tons demand by 2024. Favorable regulatory framework towards GHG emissions restriction along with strong manufacturing base of detergents and refrigerants in France, Germany, Belgium, and Netherlands should drive industry growth. France zeolite 4A market size may witness average industry gains. Strict regulations by government to ban usage of phosphate in detergents should drive country growth. Global zeolite 4A market share is fragmented due to presence of several industrial players. Major industry players include PQ Corporation, Clariant International, Tosoh Corporation, and BASF. Zeolyst International, a subsidiary of PQ Corporation manufactures, develop, and commercialize a wide range of zeolite 4A grade and its applications to their end-use customers. The company manufactures its products in its three manufacturing units present in the U.S., the Netherlands, and Belgium, which have applications in different industries including refining, petrochemicals, chemicals, environmental, and automotive. Zeolite 4A market, finds uses for low or non-waste technology in detergent industry due to properties as they are environmentally safe, higher sequestering power even at higher temperature, and doesn’t show fertilizing effect. It should be stored in dry condition with air-proof package, should not be exposed in the open air, and prevent against alkalis, water, and acids. Molecular seives are further classified into three different grades, 3A, 4A, 5A and 13x. It is substitute for Sodium Tri poly phosphate (STPP), as it is environmentally safe and has excellent ion exchange capacity. In addition, oil & gas industries expansion along with growing catalysts demand that provide higher yield should drive zeolite 4A market growth over the forecast timeframe.